Flight 77 could not have smashed through three separate rings of the Pentagon. And as for the inside of the Pentagon, there's another hole, approximately six feet in diameter... ...Found on the other side of the C Ring, three rings from the impact. 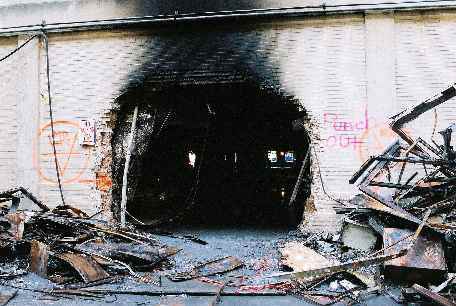 For that hole to have been caused by Flight 77, the Boeing would have had to smash through nine feet of steel reinforced concrete. 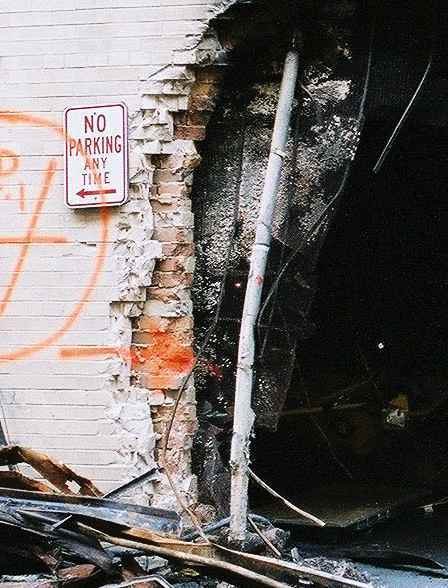 American Airlines Flight 77, a Boeing 757, is alleged to have punched through 6 blast-resistant concrete walls‹a total of nine feet of reinforced concrete‹before exiting through this hole. ...the aircraft frame most certainly was destroyed before it had traveled a distance that approximately equaled the length of the aircraft. The debris that traveled the farthest traveled approximately twice the length of the aircraft after entering the building. To come to rest at a point 310 ft (figure 6.6) from the area of impact at a speed of 780 ft/s, that debris experienced an average deceleration of approximately 30g. The influence of the structure on the deceleration of the aircraft (and,conversely, the influence of the aircraft on the structure) can be appreciated by comparisons with examples of aircraft belly-landed in controlled circumstances. In 1984, the Federal Aviation Administration (FAA) conducted a controlled impact demonstration (Department of Transportation 1987) to evaluate the burn potential of antimisting kerosene fuel. In that test, the FAA landed a Boeing 720 aircraft (weighing approximately 175,000 lb) without landing gear on a gravel runway at Edwards Air Force Base.The aircraft in that test was flying at approximately 250 ft/s when it made first contact, but it slid approximately 1,200 ft before it stopped. Although the test aircraft was traveling at approximately one-third the speed of the aircraft that struck the Pentagon, its sliding distance was approximately 3.9 times that of the Pentagon attack aircraft. Clearly, the short stopping distance for the aircraft striking the Pentagon derived from the energy dissipated through the destruction of the aircraft and building components; the acceleration of building contents; the loss of lift when the wings were severed from the aircraft; and effective frictional and impact forces on the first-floor slab, the underside of the second-floor slab, and interior columns and walls. No suggestion here that the distance travelled by Flight 77 debris was “too long”, in fact it was considerably less than the marginally lighter, much slower Boeing 720. Of course the report isn’t specifically spelling out the energy that would be lost in passing through the building, either. What about that “nine feet of reinforced concrete”? 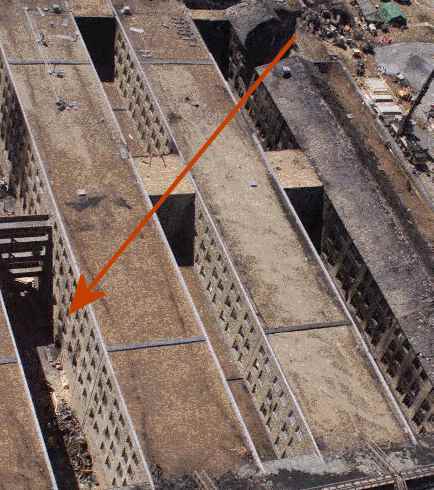 One assumption being made here is that Flight 77 passed through 6 reinforced concrete walls, each 18” thick, but that is nothing more than an assumption. Take a look at the above photo, and you’ll see the rings are four windows deep at the left hand side (where the exit hole is), three deep in the next ring. The ground floor, through which the plane travelled, is open plan -- internal walls only, no reason whatsoever to believe they were “18” of reinforced concrete”. If anyone tells you “well, they might have been”, then go search the Pentagon images. We’ve seen none from the initial shots where it’s full of debris, to the reconstruction shots afterwards, that show any sign of or structural requirement for such massive internal walls. (But don’t take our word for it, any more than you should take anyone else’s. Go look for yourself). The perimeter exterior walls of Ring E are faced in limestone and backed with unreinforced brick infilled in the concrete frame. Nearly all remaining exterior walls are 10 in. concrete.The first story at AE Drive is brick infilled in the concrete frame, with no windows.The concrete walls have 5 by 7 ft openings for windows and include columns built in as pilasters, corresponding to column locations below, and girders reinforced within the wall. And here’s the left-hand side of the hole, at full resolution: two layers of infilled brick, just as the report says. Some metal bars as well, pulled forward (they’re easier to see in the full version), but definitely not 18 inches of reinforced concrete. So we have one known reinforced concrete wall, at the front of the building, and one two-layer brick wall at the rear. In between would have been internal walls which would offer further resistance, but don’t believe anyone who gives you totals like “nine feet of reinforced concrete”, or tells you that Flight 77 debris couldn’t have travelled for what the ACSE called a “short stopping distance”, unless they actually offer some supporting evidence that stands up to your investigations.